The new movie comes out NEXT WEEK! eeeek I’m so excited as well as completely shocked at how fast time has flown by over these past months. My friends and I had a craft day to work on potter crafts this weekend and just to build excitement for the flick. Yes we’re nerds and I love it. I started a potter themed wreath. It’s definitely not done but I hadn’t thought it through enough. I need to add some more things, maybe I’ll go to the minatures section of the craft store, or print up some images, do you guys have any ideas of what I should add? I think a Hogwarts crest, Hedwig, maybe a vial with silver in it like a memory, some moss around the car, I’m not sure I need more ideas. Linda made her very first necklace with Gryffindor colors and it turned out amazing. I fear that we may all be starting a new dangerous hobby, um thanks Linda. We made a load of freezer paper stenciled shirts (I’ll post directions on how to do that soon, it was so cool and easy). 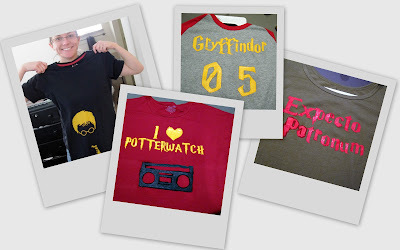 I made “Make Love Not Horcruxes” for me, Heidi did the Sin City style Harry, Linda did the Expecto Patronum, I made the musicmaker the Gryffindor shirt and my sister Tanya did the Potterwatch (remember that radio show) I love hers, I kinda want to make a tote bag with the same idea. And then I had all the stuff for a baby Gryffindor ruffle diaper cover onesie set. I was also going to make a Potter-y sign I want it to say 9 3/4, Grimauld Place, Privet Drive or Hogsmead, okay maybe I need to get more signs and do all of them since I’m not sure if I can decide. And of course I wanted a Potter themed headband that I didn’t get around to and for sure some pillows. So don’t be surprised if you see some more Potter crafts soon. I posted the freezer paper stencil tutorial and another tee alteration tute here. Curious about The Wizarding World of Harry Potter? Check out my pics and reviews from my trip here. Hehehe! I love the shirt. I should make one for the husband. He’d love it! ha! I was wandering around craftgawker and saw this post…thought of you…then realized that it was you!!! love it! happy crafting!! Saw this at “Just Something I Whipped Up”, totally made my day! Love it! Ohhhhh..great items..my 8 year old is going to love seeing your blog. Thank you for sharing!! Come by and visit my whimsical world when you get a moment or two. I love your shirt. I can’t wait for the movie to come out too! LOVE IT!! I made a shelf in my built ins that is dedicated to HP, but next summer the whole shelving unit is getting the HP treatment. I am also thinking about dressing up for the midnight showing!! =) Anyway I LOVE the crafts, you could do a “subway art” sign with HP stuff in it. I also love the wreath, maybe add a wand, a snitch, the sorting hat(they used to sell a tiny one at the book store). Off to look at more of your HP stuff!! OMG I’m totally making one of these! Thanks for the idea! HAHAHA! This is SOOOOOOO AWESOME! I love Arry Pottah! lol! I did a double take when I saw the shirt. Too bad I didn’t see it sooner, I’m headed out to the midnight show in 2 hours! I have to got know how you made that shirt! LOVE IT! Going to see the movie this afternoon! I’m glad you’re all liking the horcrux shirt I totally love it! and thumba that is stinking hysterical! awesome! wish I had seen this before I went to the movie yesterday!!!! I know this was in anticipation for HPDH1- but- a blogger I follow found it, shared it- and I loved it! In fact, I made a post that included it! Just wanted to let you know! I also found some downloadable HP fonts that you might appreciate which are linked in the post as well!